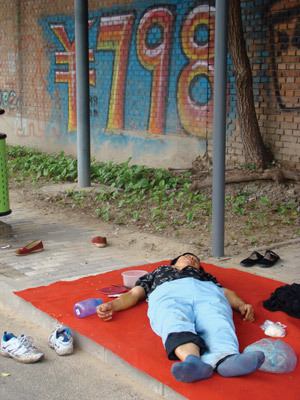 Article written by Boliang Shen (Beijing-based curator and journalist at Artinfo China). The article has been translated from Chinese into English by Fang Liu in June 2012. The original article of this slightly edited version appeared in Artinfo China, on 25th May 2012. “The ‘Occupy’ movement is not a carnival-style entertainment”, but on May 12th, at the Piazza Verdi next to the University of Bologna, what I saw looked just like that: students wearing costumes of ancient Roman generals, medieval knights or pirates (“These where actually students from the local university’s fraternities, probably celebrating their graduation”, editor’s note) and holding placards with creative slogans addressing different social and political issues gathered at the square under the sun, they drank beer, engaged in animated talks… when dawn drew near, a truck carrying a rock band drove across the square, following behind was a long procession formed by groups of students, smoke of fireworks lighted to herald the procession gradually spread and seethed in this old, red city known for its tradition of radical resistance. The “Global Strike Day” march had just began – “in the eyes of the Chinese, this is a spectacle, another disguise under the protection of capitalism”, said the artist Zhou Xiaohu who was with me. 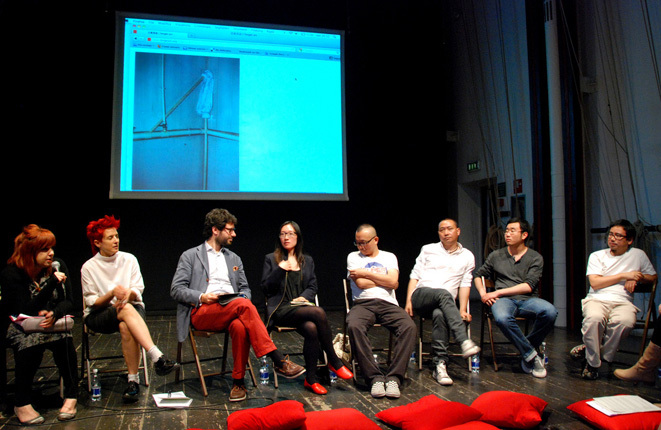 At the time, I and four other artists and curators (i.e., Ma Yongfeng, Ni Kun, You Mi and Zhouu Xiahou) were invited by European Alternatives, a European civil society organization, to participate in the art exchange in Rome and Bologna as part of the Transeuropa Festival co-hosted by the European Alternatives and the Transeuropa Network, which took place in 14 cities across Europe. On the other hand, it is not like the “May Revolt” of ’68 in France, as many people have understood – “a group of young people growing up after the war revolted against a prosperous society”. Italy is experiencing a serious financial and social crisis. The young people I met showed anxiety over employment after graduation, and expressed concerns over tax hikes and high suicide rate in this city. According to a BBC report, there was a “White Widows March” in Bologna the weekend before we arrived, husbands of the women in the march killed themselves under the burden of deep recession, many were business men – that reminded me of a passage mentioned in the “Capital”, which has often been ignored: do not blame individual capitalists, they are victims of capitalism too. Reports of infectious suicides were all over the place. This March, a craftsman burned himself to death in front of the local tax court. Two days before we arrived, Maurizio Cevenini, a beloved left wing party leader and former mayoral candidate in Bologna, threw himself off a council building. His funeral was held on 12th May, the whole town was in grief. 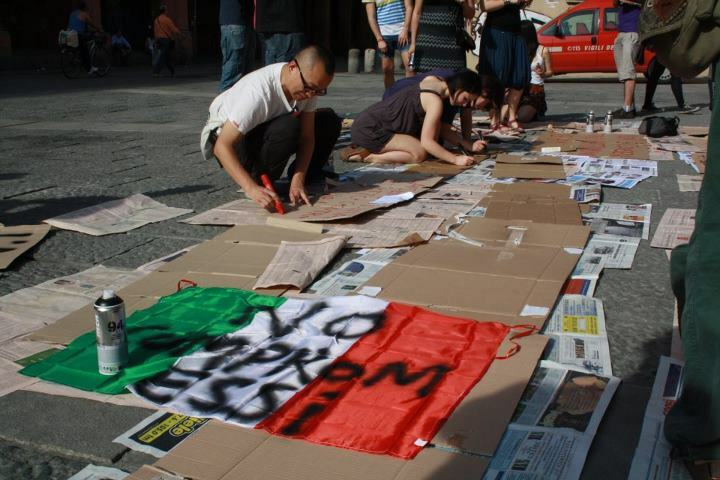 Ma Yongfeng’s “micro-resistance” event scheduled for that morning at a square near the city council was moved to the afternoon on the same day at Piazza Verdi next to the University of Bologna. Back in China, movements of “micro-interventions”, “micro-practices” and “micro-resistance” had been well received. Would the effect and meaning of “micro” become difficult to execute or express anything in the mighty context Bologna, where people have been so agitated? Continuing the pattern of creating graffiti on site in Bernard Controls, Ma wrote sentences on recycled cardboards, scrolls of fabrics, flags of Italy and EU, some were with indefinite indications such as “Sensibility is Under Control”, “Action is Product” and “You Can Steal ‘Now’, but Future is In Our Hands”, some were reflections on radical demonstrations – “Do Not Let the Protest Become a Pollutant-Free Ethical Gesture”, “Is It a Revolt without Revolution?” and so on. He also interacted with the students, asked them to write down their thoughts. However, in the deluge of slogans and graffiti of Bologna, could their words be noticed and understood as delicate and firm heterogeneity? After the brief exchanges, would the students deviate somewhat from the radical way of thinking they have been used to for the thoughts written down by themselves? Lorenzo Marsili, co-director of European Alternatives, asked what if someone from a radical group challenges him? Ma Yongfeng replied: “I’ll ask him to explain his point of view in one sentence, then I’ll write that sentence on a cardboard and give it to him in exchange of the placard he is holding.” That was an interesting idea, but, no one came forward to challenge, and each group kept to itself. There were some minorities who could hardly blend in stood by and watched. A Chinese friend who studies in University of Bologna said: “Protests and demonstrations happen here almost everyday, they have become a way for the people here to participate in public life, express opinions and positions, or legal channels for criticisms, just like us Chinese tweet our complains online…”. I had a long conversation about the issue with Sara Saleri, a member of European Alternatives, who has studied semiology with Umberto Eco. She thought that the student march we saw should not be deemed as a typical example of the entire “Occupy” protests and street demonstrations happening in Italy. Those young people were simply expressing themselves, they were anxious over the future, but had limited understanding of the substantial problems of the society. She admitted that street protest as a legal public means has a long tradition. However, she stressed that at about the time when the financial crisis started, street movements began to have whole new forms and claims. “Commons”, “common goods” are terms mentioned often in the above movements, but they are relatively new concepts to Chinese readers. The easier examples are “Wikimedia Commons” and “Pirate Parties International” (PPI). The latter, first appeared in Sweden in 2006, started by opposing corporate copyright law’s restrictions on online downloads and hindrances of circulation of knowledge, and supporting legalization of online resource sharing. Later it grew bigger and expanded to many countries. Its claims have also been extended, by advocating openness and transparency of online information, government transparency and protection of civil rights, establishing a freer civilization and opposing outdated patent laws and monopoly. “Online governing” is another trait of the parties, they take advantage of online social networking sites such as Facebook and Twitter to allow party members exercise their rights, announce policies, collect opinions and eliminate hierarchy. Its political stance has thus been established. Last September, the Pirate Party in Germany took 9% of the vote in Berlin elections. It was allowed to enter Berlin Parliament for the first time in history. Some people consider that the inception of alternative governance model. It is necessary to mention that, one reason for “commons” to become a keyword is closely related to Elinor Olstrom’s brilliant research on the concept – which won her 2009 Nobel prize in economics. Her study rip the notion of the negative connotation derived from the well-known article “Tragedy of the Commons” by Garret Hardin in 1968. Also, I must mention the book “Commonwealth”, co-written by Antonio Negri and Michael Hardt, and “The Common in Revolt”, a collection of dialogues between Judith Revel and Antonio Negri. Both are important sources on “Commons” in Italy. This year, the Transeuropa Festival in Bologna held symposiums on issues of digital commons, co-working and co-housing, new chapter of European commons and immigration policies. In Rome, posters advocating water as a common good are often seen, the campaign started last year based on nationwide queries made by two legal scholars of International University College of Turin. According to the result, most Italian considered that water should be deemed as a common good and managed by the people, so they oppose privatization of water. Shortly after, on June 14 2011, the famous theatre Teatro Valle, built in the 18th century and located along the Pantheon and the Senate, was occupied (Luigi Pirandello’s “Six Characters in Search of an Author” made its debut there). The theatre used to be managed by the ETI (Italian theatre association); then the ETI was closed and the theatre shot down due to high costs and decline of the industry. It was said that the theatre would be bought by a tycoon and converted into a restaurant. Therefore, workers of the arts and entertainment were mobilized through the internet to occupy the theatre, they claimed that culture is a common good, just like the water and the air, and the theatre shall be managed by the citizens. Now it has been almost one year now since the Teatro Valle was occupied, shows have been put on almost every night, performances are open to all citizens who pay as much as they wish. The occupiers and citizens ensure the quality of the performances through public assemblies – “We don’t need to vote, we listen to the reasons of those who say ‘No’.” The occupiers who accepted to be interviewed by me admitted that those were simply the first step of the occupation; they need to develop an alternative managing model of “common wealth theatre” in order to resolve financing and workers’ payment issues, and introduce the model to the government and citizens. For the time being, occupants still make their living from jobs outside of the theatre, they take turns to guard the theatre 24 hours a day, so the government wouldn’t have any chance to evict them – “the government does not even shut off the water and light, probably for fear of further intensifying the conflict…”. Similar occupations have erupted involving several other theatres in Rome and many cultural institutions across the country. In Rome, an audience asked about the current fever in China of building museums. Zhou Xiaohu replied frankly that “those are simply some art ‘houses’, and we do not benefit from them” – “But, I believe one day we will occupy those ‘houses’ as well.” Regarding the above-mentioned issue that whether the “alternative” art practices in China are part of the global “anti-capitalism” movement, Ma said that what is important in the world today is not movements with clear guiding ideology, but numerous “tenuous” movements that are organized voluntarily by the people. Afterwards I asked Sara Saleri and Gian Paolo Faella, PhD in History of Ideology at the University of Bologna, whether the movements of “commons” and “alternatives” are a direct revolt against capitalism, or just an improvement plan for the status quo. They admitted that opinions have been divided among participants, albeit those opinions derive from the desire for change. “Down with capitalism” is a political appeal belonging to a distant future. That is certainly too reserved in the eyes of a radical. Slavoj Žižek once said that if we try to improve capitalism inside the system, it would only extend the life of capital, the beast, and make modern states, “committees of administering common affairs of the entire capitalist class” even healthier. I also asked, if expanding the context of “commons” in which the backgrounds of members of co-governance and the circumstances are more complicated and diversified, will the model fail or end in disaster, like various communes or utopia in the past? Gian Paolo Faella considered it a very important question in the practice regarding “commons”, what resources could be “common wealth” shall be judged carefully – they shall be limited to resources on which the subsistence of all people rely and cultural resources shared by a community. To me, instead of establishing a country where everything is eventually a commons, the entire work regarding “commons” shall aim to the autonomy by the people on certain public resources, consequently make a government become a more idealized “limited government”. I am tired of asking questions that aim for “a clear direction” or “ the final goal”, which probably came from the habitual way of thinking imprinted on us by Leninism: a movement must have clear goals and plans designed by an authoritative figure or the highest commission, which would instruct the masses to strictly carry them out. Maybe we can bring up here the legacy of the German revolutionist Rosa Luxemburg, Lenin’s contemporary: contrary to Lenin’s favour of control and giving orders, Luxemburg emphasized the importance of disorder, noise and active, large-scale social events. She stressed the creativity and morale of each participant, deemed a revolution as “a complicated and organic process”, any division or intervention to the process would threaten the vitality of the organism as a whole – which are quite similar to “chaos” “complexity” and “self-organization”, concepts of modern science. Alexandra Kollontai, a Luxemburgist from the elite of the Soviet Bolshevik, also thought that to accomplish a revolution and create new forms of production is like riding on uncharted waters, therefore, action itself is superior then a blueprint or plans. She asked: “Can the smartest manager of a feudal estate invent early capitalism by himself?”. Similarly, without action, we should not expect the experts trained within the frameworks of capitalism and socialism be able to build a wonderful model for the future. Due diversi tipi di curiosità sono protagonisti del dibattito che si svolge all’Atelier Sì, a Bologna, venerdì 11 maggio, sugli spazi dell’arte tra Europa e Cina, con la partecipazione di artisti e curatori italiani e cinesi. La curiosità ingenua del semplice incontro, forse non dissimile da quella che rese un giorno il Milione un best-seller, e una più ficcante e più avida, se non di risposte, di squarci sui grandi punti interrogativi che campeggiano in chi, specificamente, ha a cuore l’arte in un mondo che cambia. Un dibattito per pochi, sì, ma non per intimi, capace, cioè, di attrarre curiosi, intellettuali, forze vive della città che accoglie per alcuni giorni Ma Yongfeng, Ni Kun, You Mi, Zhou Xiaohu, Chen Xiaoying, Shen Boliang, nell’ambito delle iniziative del Transeuropa Festival. Così quando, con la benedizione della padrona di casa Fiorenza Menni, Luigi Galimberti pone agli artisti ospiti del Transeuropa Festival i suoi quesiti su quali siano in Cina gli spazi di produzione dell’arte, su come i curatori gestiscano lo spazio, sul rapporto che lì trapela tra pubblico e privato, si ha dapprima l’impressione di essere in un luogo di discussione per certi aspetti persino convenzionale, professionale, educato. Ma è il pubblico a irrompere: che cos’è lì l’arte, che cosa fate voi “artisti”, in sostanza? Così scopriamo che gli interlocutori del Sol Levante sono fondamentalmente degli intellettuali, anche se non è questa, forse, la parola a cui pensano. Ma Yongfeng va nelle fabbriche e propone il suo onirico piano industriale dipingendo dentro i capannoni e cantandole al bieco capitalismo a suon di vernice: Invest in contradiction. Scrive per chi lavora, raccontandone la quotidianità, proprio nei luoghi della sua fatica, della sua condanna, della sua resurrezione. Sensibility is under control, dipinge a caratteri cubitali in un deposito di materie prime o di semilavorati. Autocostituitosi autorità, cioè, ammonisce il padrone, il manager, il proprietario, facendo finta di parlare con quegli altri, gli operai: arte anche lì è soprattutto una grande finzione. Ni Kun, dal canto suo, costruisce un collettivo di artisti nelle campagne attorno a Chongqing, e lì intervista i contadini, proprio come un sociologo nell’Italia degli anni ’50. Lo scopo di queste attività non è di pubblicare – ci racconta – ma migliorare la vita delle persone. Un manierista, forse un alchimista, egli dunque non pubblica ciò che sa, anzi: egli conosce proprio perché non rende pubblico ciò che conosce. Questa è arte, signori: mostrare facendo. E ancora molte domande, e sullo sfondo naturalmente la politica, e il gusto, in fondo così europeo, di dare risposte più impertinenti delle domande stesse. Chi finanzia l’arte, in Cina? Non c’è bisogno di soldi per fare arte. Che differenze culturali ci sono nella concezione dell’arte tra Europa e Cina? Non ci sono differenze culturali, ci sono soprattutto differenze politiche, differenze di opinioni politiche; proprio per questo è positivo incontrarci, tuona You Mi, probabilmente la più realista del gruppo. E ancora, che cos’è un collettivo di artisti? Il collettivo è in Cina una pratica di resistenza come la intendiamo noi, con esperienze come Macao o il Teatro Valle? Sì e no. Forse, è difficile dirlo, il background è molto diverso. L’artista è principalmente un curatore.Certo, e se è per questo l’autore è come tale un editore, così come il politico è come tale principalmente un moderatore. La terra della Grande Moderazione, con i suoi lunghi, e soprattutto lenti fiumi, sembra volerci insegnare molto, ribattere colpo su colpo, e, senza alcuna difficoltà, stupirci. Abbiamo soprattutto progetti di lungo periodo. E perché? Perché le grandi trasformazioni che sta vivendo la Cina richiedono, per comprenderle, una immaginazione che guardi più avanti. C’è un rapporto – chiede ancora Elvira Vannini – tra le pratiche di ricerca alternative e il mercato dell’arte e, più in generale, con il sistema dell’arte? Non esiste un sistema dell’arte, in Cina, ma tanti micro-sistemi diversi. La Cina dunque non produce solo beni di consumo, e magari anche di bassa qualità, ma anche cultura, molta cultura, questo è il messaggio principale che ricaviamo dall’incontro. E per chi non lo sapesse, forse questa è già una notizia. Più che altro, nella giornata dell’11 maggio e non solo, prima ancora che produrre arte sembra produrre molta filosofia. Quella capacità, cioè, di dare risposte inaspettate, e di trasformare il mondo solo in quanto si osa prima tentare di comprenderlo. Gli spazi dell’arte, nelle parole che emergono più spesso, sembrano essere soprattutto spazi di riflessione, più che di lotta. Tuttavia appare estremamente difficile capire se ci sia una reale distinzione tra le due cose. Sia tra le città immense e caotiche, sia tra le infinite e povere campagne di quella terra che, paurosi, vorremmo ma spesso non riusciamo a conoscere, siamo portati a immaginare pochi, selezionati, spazi ampi per la civilizzazione e per il libero pensiero. Spazi per gli incontri, per offrire a chi passa solo per pochi giorni la propria verdura, per farsi consigliare un libro e rinforzare legami diversi dai semplici legami familiari e tradizionali. “Gli spazi dell’arte”, come li hanno chiamati gli organizzatori del singolare incontro. Forse, qui da noi, ci permetteremo di continuare a chiamarli anche spazi della politica. “Qui posso e non voglio, lì voglio e non posso, misero, manchevole, in entrambi i luoghi”, scriveva un tizio considerato molto europeo, se non che di fatto era africano, chiamato Agostino. Eppure noi europei, mai come oggi “miseri”, soprattutto di spirito, in Cina vogliamo e dobbiamo andare. Con la mente, con gli occhi, se non altro. Seduti su rossi cuscini dialoghiamo così per alcune ore, tra le corde che, attaccate ai muri, costituiscono la scenografia che più caratterizza quel teatro. Sotto quelle corde nessuna tensione, e soprattutto nessuna contrapposizione, ma solo il gusto perverso di riformulare le parole che riteniamo le più indicate a nominare le nostre passioni. L’appuntamento tra artisti e appassionati di arte, tra Europa e Cina, è per un prossimo incontro. Il dialogo – e non può che essere così – continua. A particular and much remarked upon characteristic of the Chinese art scene is the hyper-commercialized,gallery-based system. By and large an import from the West, the Chinese gallery system over the last ten years has swiftly matured, serving as an important point of connection between Chinese artists and the outside art worlds. For better or worse, the galleries and the commercial systems they embody dominate the Chinese art world, with the phenomenon of discrete art districts (such as Beijing’s 798 and Caochangdi, or Shanghai’s M50) developing as the most visible manifestation of a state-sponsored recognition of the economic and cultural power of contemporary art. However, this development has seemingly come at the expense of critical engagement and relevance to its greater social context. There is a great risk of failing to move beyond or advance due to this juggernaut of industrialized contemporary art. This situation seems to be a symptom of China as an active but juvenile participant in the international art scene: the development of a mature art system incorporating a productive sense of self-criticism has simply not had time to develop here. And yet a number of artists and organizations have looked for ways out of this impasse. By consciously straddling the divisions between the art organization, artwork, and society, they play with the same concerns but push meanings and boundaries in unlikely directions. Given their positions of relative and flexible autonomy from the systems they are addressing, they are also able to critique without suffering fatal consequences. In a certain and very real respect, their capital is intellectual and social rather than financial, and if they are inclined to critique the gallery, museum, artist or society by playing out its roles, they are given more leeway in that respect. These “spaces”—although only some of them have a tangible, permanent space—are putting methodologies into place that are in dialogue with and in criticism of the existing systems. They are a set of people and organizations who are fully aware of how their activities sit in relation to the less critical sectors of the (Chinese) art world, and hence serve up work and actions that try to break through the issues and problems arising from such an art world and the larger society of which it is a part. Although suitable as a point of departure, “alternative” is a misnomer for these spaces. That word is commonly understood to be “in opposition,” but these artists and curators think of it as “in addition.” They are not trying to be “alternative” for the mere sake of difference, but to go beyond these things they find fault with, one of which may be the very concept of “alternative” itself. For instance, the use of this term is not necessarily about anti-commercialization per se, but more specifically in confrontation with the kind of uncritical commercialization of the current Chinese art world. These organizations are an “addition” to the forms of galleries that seem so inflexible: unable to deal with certain types of work, only allowing certain channels and forms of activity within their walls. A common tactic is for them to ostensibly position themselves outside the gallery system while maintaining a connection to it for their own purposes; dipping into and out of the various art structures as they see necessary. In many cases galleries, formal exhibitions, and traditional art structures are simply unnecessary to them. Not actively “anti-,” but happy to pick and choose moments of inclusion and exclusion wherever possible on their own terms. Their actions are often characterized by a sense of subtlety and invisibility as a way of countering overbearing systems and structures. Just to list a few examples: HomeShop brings shop-front practices to the hutong context and promotes social activities that occur near its location in a local neighborhood setting, thereby “crystallizing” events out of daily activities. The Donkey Institute of Contemporary Art brings the art context directly to a moving public, redefining it in a mobile format. 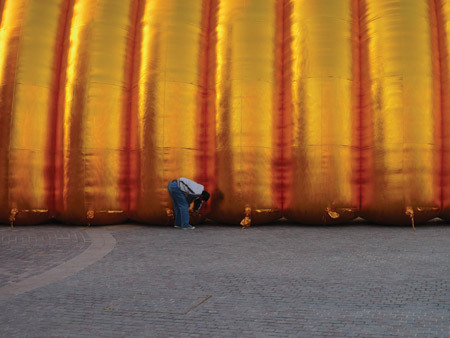 Artist Chen Xinpeng’s tent for last year’s mobile “Cou Huo” exhibition organized by Red Box Studio also carries his activities to non-art areas, with structures to facilitate pop-up shows and spectacular practices, open to art and non-art activities. 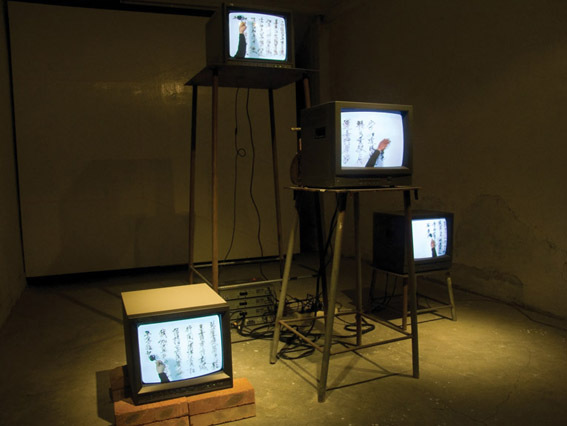 Ma Yongfeng and his “forget art” collective rework ideas of minimalism and conceptual practices, playfully confronting institutionalized art formats in China, including a recent exhibition in a bathhouse. And Emi Uemura opens up discussion in the specific context of China’s food and agricultural realities, taking on social concerns in the particular situation in which she finds herself. Talking to these artists and curators, recurring motifs are their practices as facilitators andplatforms for the art-making process—the suggestion being that these are difficult or impossible to find with existing institutions and methods. Behind these activities lies a looming feeling that art is now increasingly recognized and naturalized as a production system, on the same level as any other system of production, and not automatically privileged. They are wary of these systematic forces of commoditization and commercialization. They do not hold Art in such reverence as in the past, but take it rather as a domain to be only selectively employed. These methods and practices are common in the international art historical context. They rehearse fundamental issues with the privileged position of art as seen in strands of Western art history. But where they transcend these is in the artists’ relationship to the specific conditions in China—they are original in this respect. In China, these positions are relatively new approaches to making art, and in this context new possibilities for the future of art are created, possibilities which will need to be addressed by these artists and their peers. These possibilities do not simply play into existing systems, and by their immateriality or impermanence act to gain space without production as such. The works can seem to be distancing, maintaining a relationship which does not fully subscribe to or get subsumed by any particular end. This idea (of the semi-formed action with no particular aim or expected conclusion, which has a political inflection simply in its avoidance of common forms of political activity) seems to be particularly appropriate in this situation defined by appearance. And, as has been seen in these practices elsewhere, it must be forever delayed in its path to production—its futility is potentially unending, though “delay” and “futility” are central to its potential for action. The spaces profiled in the following pages play a vital role in developing art systems with larger implications, starting at the level of localized production. The production of these “alternatives” addresses perceived problems or deficiencies in the system. Their existence is an important aspect in the critique of art and the critique of its dissemination. Experiments and new forms of presentation are important to provide depth and perspective to the art world and to take it away from an over-reliance on a limited and limiting way of dealing with art and the locations in which to experience it. What might be called a “healthy art ecosystem” supports these multiples avenues of experience, providing the checks and balances that prevent one section of the system from presenting a distorted vision of art and its value, as has become the case in the Chinese art scene.